When exploring real estate on St Simons, you canâ€™t help but become enchanted with the islandâ€™s rich history, including that of its lighthouse. Our lighthouse is just one reason that people choose St. Simons Island as their vacation destination and often, as their second home. The St. Simons Island Light is located on the southernmost tip of St. Simons Island. The current structure was built by the government in 1872, replacing the lighthouse that was ruined during the Civil War. Located just west of the site of the original lighthouse, the current one sits atop a two-story brick Victorian structure that originally functioned as the light keeperâ€™s house and is now the Museum of Coastal Georgia. Built in 1810, the original lighthouse was 85 feet tall including its lamp. In 1862, according to historical sources, Confederate soldiers destroyed the lighthouse as they retreated from a Union troop invasion, preventing the light from assisting additional Union warships with their navigation efforts. In addition to the brick light keeperâ€™s residence, the new lighthouse also included a biconvex Fresnel lens, one of only 70 such lenses currently in operation throughout the U.S. These lenses are well known for their ability to transmit greater light over longer distances than most other lenses. 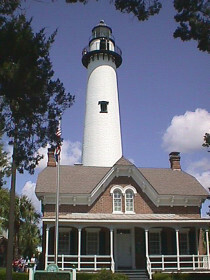 In 1985, the St. Simons Lighthouse opened to the public. Visitors can explore both the brick house and the tower, climbing the cast iron spiral staircase leading to the galley. The Coastal Georgia Historical Society took possession of the lighthouse from the government in 2004, in accordance with the National Historic Lighthouse Preservation Act of 2000. The tower has been restored several times, most recently in 2010. Luckily, the structure has been well maintained over the years and has required very little renovation. According to the professional restoration team, the lighthouse demonstrated only some rust and wear and tear, and it still had its original cast iron windows. The county plans to restore the keeperâ€™s house next, since it received a $250,000 grant in February 2012. The U.S. Coast Guard now maintains the light because itâ€™s still an active lighthouse, guiding sea vessels into St. Simons sound. Situated off Beachview Street, at the end of 12th Street, the museum and tower are open daily to the public. We invite you to visit the lighthouse and the other gorgeous attractions on St. Simons Island. Contact DeLoach Sotheby’s International Realty for more information about St. Simons and Sea Island real estate here.